Stephen R. Covey is an internationally respected leadership authority and founder of Covey Leadership Center. He received his M.B.A. from Harvard and a doctorate from Brigham Young University, where he was a professor of business management and organizational behavior for 20 years. His book, The 7 Habits of Highly Effective People, has sold more than 10 million copies and has been translated into 30 languages. A. Roger Merril, a well-known leader in time management and leadership development, is a vice president and founding meember of Covey Leadership Center. He holds a degree in business management and has done extensive graduate work in organizational behavior and adult learning. Rebecca R. Merril, a mother, grandmother, homemaker, and accomplished author, has also served in numerous leadership positions in a variety of community, eduational, and women's organizations. I really enjoyed the CD, listened to it twice. I was disappointed at first that it was only 1 CD, thinking I had gotten too much of an abridged version. But it turned out to have all the great information, with none of the superfluous stuff, so i really enjoyed it. 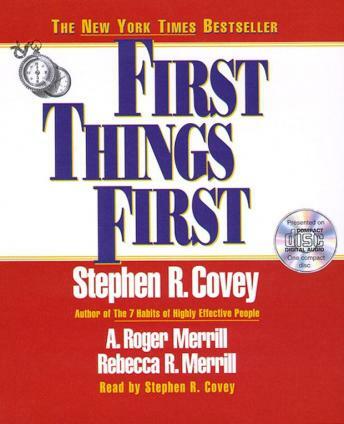 I've listened to Covey before, and I must say that this title encompassed all of his great ideas into one 1 hour + CD. I give him kudos for getting such great ideas and information, condensed into a simple listen that doesn't take too long to finish, and can be listened to over and over easily. The CD's were scratched. Needless to say I returned it without listening to the whole book. Already in his previous books. If you've listened to 7 habits and 8th habit, you don't need this. Mr. Covey is a boring reader. Although the content is interesting and thought provoking, most of it I have heard before.